Adrian and I began the slow trip home on Saturday. First we said our goodbyes to the rez, to family and old places. Then we stopped at a small store to buy $70 worth of Glazier’s Frankfurters. Glaziers are what I grew up referring to as “American hot dogs”, because they were only available when we went to the American side of the rez, in upstate New York. They have bright red casings and the sausage filling is a dark pink. They are my father’s favourite hot dog, and since he can’t drive down to Potsdam, Malone, or Massena every week to buy a new pack he has my sister bring him 15 or 20 pounds of them every time she visits. They are delicious, and many of the first page Google results for Glazier’s Frankfurters attest to this. However, the other first page Google results refer to recalls for various food safety problems over the years. So, there’s that. Adrian and I drove across the bridge from New York to Cornwall Island, passing the abandoned Canadian customs house that, up until last year, had been the choke point for border crossers. News that the customs agents wanted to carry firearms elicited a very loud response from the Mohawks on the rez. A standoff closed the border for a while: Canada Customs claimed to fear for their officers’ safety in light of the protests to arming the agents, and the Mohawks refusing to quietly allow federal officers to arm themselves on Mohawk land and wave guns in the faces of families with crossing rights dating back to the Jay Treaty. Eventually Canada Customs built a temporary checkpoint in the City of Cornwall across the river and, as far as I know, armed the border agents. They left the old buildings behind on the Island, and for the first time in my life I didn’t have to stop at those windows. 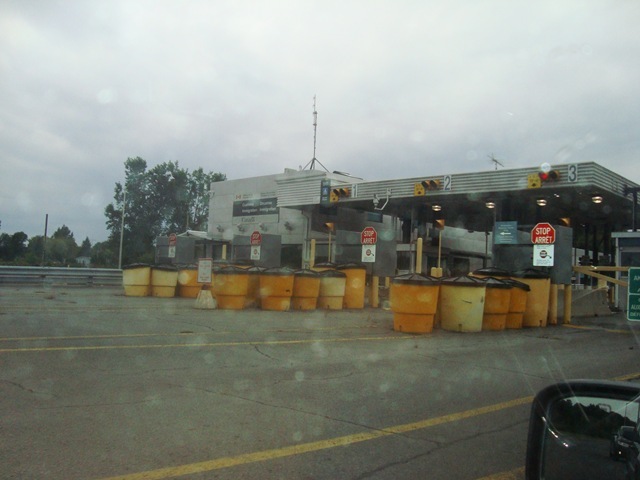 When Adrian and I arrived at the new border checkpoint I was asked the usual questions. “Where do you live? Where are you going? Why are you going there? Why were you on the reservation if you live in California? Where is the child’s mother? Do you have a note from her?” Planning ahead I’d had Emily put a note detailing our trip on her firm’s letterhead then had it notarized for good measure. The Americans didn’t care what I was doing bringing a child into the U.S. with a U.S. passport, but the Canadians were very concerned about American children getting abducted into Canada. The customs officer also asked “Are you bringing anything into Canada?” to which I replied “15 pounds of Glazier’s hot dogs”. Frankly (get it?) I expected that to raise an eyebrow. But apparently my father isn’t the only Canadian who likes them. We drove through Cornwall and out onto the 401. It started to rain on us as we passed Upper Canada Village, and it sprinkled on and off for most of the drive. Knowing how much driving I was going to be doing on this trip I’d loaded my Blackberry up with all of my iPod songs and then remembered to pack the Jabra Cruiser I was given at a Silicon Valley Moms Blog event before Christmas. At the time I thought I’d never use the thing, a blue-tooth handsfree module that has both a speaker and a transmitter, so you can hear calls through the Jabra or on your car radio. I’ve used that little device more often, as it turns out, than just about any item I’ve received since I started blogging. I can play songs from my Blackberry to my car radio without using one of those stupid little corded things with the displays that fade out after two months. This is not a pitch or a disclosure post: I am just surprised that I ended up using the thing so much after dismissing it. I don’t know that it’s worth buying if you don’t drive a lot like I’ve been doing, but I was very glad I brought it along. We arrived in Kingston and at my father’s house in the late afternoon, had dinner and played with the kids. Adrian had been coughing a lot since we left Cornwall, so he settled in for a miserable night. I had his albuterol with me, but it wasn’t doing much for him when he was sitting upright in the car seat; it worked better once he was able to lay down, but it wasn’t immediate relief so he coughed off and on until he was deeply asleep. My father and I spent the next few hours watching guitar videos and trying to play guitar-banjo duets together. We were less than awesome, but it was still fun. Then I went to bed for my last night in Canada, the last night of the Triptravaganza! The next morning Adrian and I said our farewells to my father, step-mother and two small sisters and then hit the road for Toronto. A high school friend, the best man at my wedding more than ten years ago, had moved to Burlington a few years ago. I arrived in time for lunch and popsicles with his kids, twin five year old girls and a boy just a little older than Adrian. Adrian played with the boy’s toys, then followed the girls around while the grown ups talked about work and life and houses and friends and kids. We are all so adult now. Adrian and I said another round of farewells then drove to the airport, dropping the rental car off and then checking in at the desk. The flight from Toronto to LAX appeared booked solid, so there was little hope I’d be able to score a middle seat for Adrian again. I checked with the ticket agent at the Virgin America desk and she said the flight was very full. So when Adrian and I finally got through security and customs and made it to the gate I didn’t even bother asking them if anything had opened up; I just gate-checked Adrian’s car seat and walked down the ramp. Right before take-off I noticed that no one was, in fact, sitting next to me on the flight. Because the ticket agent herself had also been at the gate helping some travelers I wondered if she had done something to make sure that seat stayed vacant. If she had, that’s a win for Virgin, although if she had actually told me as I was boarding I could have kept the car seat. As it so happened I had a CARES harness with me just in case, so I buckled Adrian in and hoped he’d fall asleep for the duration. Little Mister Adrian hates the CARES harness, and I don’t blame him. It won’t tighten down enough to keep him from sliding uncomfortably low in the seat (even though he’s within the weight requirements for using the harness) and it lacks the head support of a car seat for sleeping. Moreover, the strap that goes over the airplane seat back was directly behind his head, and it was taut, so he was actually leaning a little more forward than he would have been if there had been no harness at all. None of this made it easy for him to sleep, and with his cough giving him trouble anyway he really needed to recline a bit and that just didn’t happen. I ended up holding him for two hours with an empty seat next to me before he finally passed out from sheer exhaustion and pissed-offedness. He slept in the middle seat for one hour before waking up and raising hell again while I held him and bounced him and fed him and gave him milk and water and changed his diaper and walked around with him and tried everything to make him happy about getting almost no sleep and being forced to sit still for four and a half hours. I’d call that flight, overall, a fail. The next leg, from LAX to San Francisco, though only an hour and a half was even worse. He was the screaming kid on a plane and I was the hapless parent who had apparently failed to take every other person into consideration when I was giving my son a chest cold that would keep him awake and miserable. Nobody said anything, or even looked at me crosswise, but I felt all the thoughts in my head and I was so tired by that point that I almost wished someone would get snarky with me so I could rip them apart. At least that would have been a problem I could solve. I felt so helpless. It was such a contrast with the flight out to Toronto that I know the difference of a car seat and chest cold had everything to do with it. Adrian loved being on the plane the first time. We landed at 9:45pm, so just before 1:00am Ontario time, and I almost broke down when Erin saw me in the baggage claim and ran over shouting “Daddy!! I missed you so much! !” Adrian said “Mama!” and I kissed Emily and all was right with the world. And that’s how Backpacking Dad’s “Backpacking Dad Goes to Canada Triptravaganza!” came to a close. With hugs and kisses in an airport hallway and a family back together again. Awww, a happy ending to a plane ride that I can readily imagine… because of your descriptive superpowers. Not b/c I have traveled with 4 infants. Nope. Triptravanganza was so well-described! Well-photoed! Sometimes it made me feel like traveling, sometimes i was glad to be home. Mostly I just wanted to taste a Glazier's hotdog, and tell a border agent that i had 20 lbs worth. Thx BPD! Is it wrong that I'm slightly delighted that you had the experience of the screaming child on the plane? Not that I really wish that on anyone (I really don't), but perhaps you being the dad traveling alone with his youngster taught a few people that times have indeed changed…and that dads can't control the tired, screaming, crying infant any better than moms (although there have been some critical stares, snorts and hrmpffs from quite a few when my children have been unmanageable. I'm glad no one dared to say anything (although I would have liked to hear your response). Lucky them. Backpacking Dad, thanks for sharing the honesty of dadhood. I find it inspiring. Dude. That trip, the last part? I've made that same trip with that same cranky pissed off kind of kid. It was not. fun. And I actually had the pleasure of being able to tell off the hung over frat boy who was being oh-so-passive-aggressive with his overly dramatic sighs every time my 18 month old made a happy noise on our 8 am flight. That was quite cathartic, to tell the truth, and I'm happy he presented me with the chance to blow off some steam. I don't think I've sweated or stressed as much over the happiness of others (who are all shooting me daggars and not grasping that coach airfare is for anyone, not just those over the age of 16) my whole life. Oh, and this Jarba thing you speak of? I'm going to have to Google that. I have bluetooth in my Jeep, but it came out a year before they started installing MP3 jacks so I can't listen to my Ipod in it. Sounds like this might be a good solution. Thanks! because it's a phone transmitting on the bluetooth signal to the Jabra.